The United States embargo against Cuba was imposed over fifty years ago initially as a response to the new revolutionary government's seizure of US properties, which was viewed by the US as a violation of international law. However, while sanctions can be legitimate means of enforcing established norms, the Cuban embargo itself appears to be the wrongful act, and its persistence calls into question the importance and function of international law. This book examines the history, legality and effects of US sanctions against Cuba and argues that the embargo has largely become a matter of politics and ideology; subjecting Cuba to apparently illegitimate coercion that has resulted in a prolonged global toleration of what appears to be a serious violation of international law. 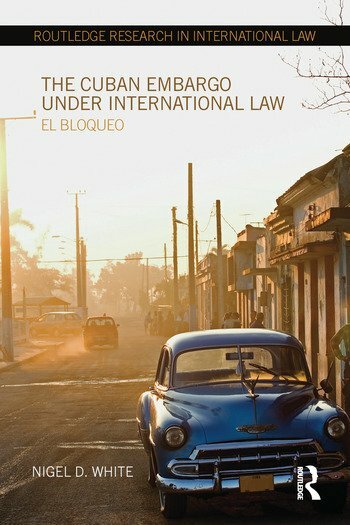 The book demonstrates how the Cuban embargo undermines the use of sanctions world-wide, and asks whether the refusal of world governments to address the illegality of the embargo reduces international law to tokenism where concepts of sovereign equality and non-intervention are no longer a priority. Despite the weaknesses of international law, Nigel D. White argues that in certain political conditions it will be possible to end the embargo as part of a bilateral agreement to restore normal relations between the US and Cuba and, furthermore, that such an agreement, if it is to succeed, will have to be shaped by the broad parameters of law and justice. As a fierce re-evaluation of international law through the story of a country under siege, this book will be of great interest and use to researchers and students of public international law, international relations, and US and Latin American politics. Nigel D. White is Professor of Public International Law at the University of Nottingham in the United Kingdom.